NKOTB and others head to Hershey on July 6 at 7:30 PM for the 2019 Mixtape Tour. Always upping the ante, NKOTB have packaged the ultimate lineup for a once in a lifetime live show experience. The group will return to the stage after 2018’s touring hiatus to perform fan favorite number one hits like “Hangin’ Tough,” “I’ll Be Loving You (Forever),” and “Step By Step”. 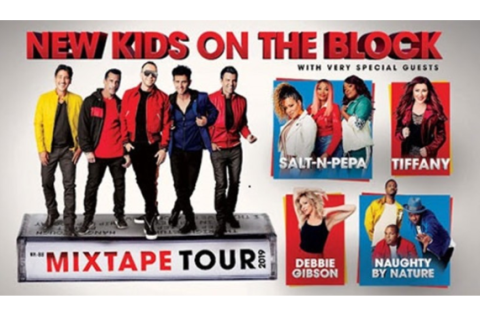 When tour mates Salt-N-Pepa, Debbie Gibson, Tiffany and Naughty by Nature hit the stage, they bring with them top chart hits and legendary catalogues to keep fans out of their seats all night. The tour is sure to be one of the can’t miss events of the summer featuring an unforgettable night full of smashes spanning across generations.